Instructions: Create a 4.25" x 5.5" card base from white card stock. Choose a patterned background paper from the Tulip Time Paper Collection for card base mat. Using the coordinating mat die from the Eyelet Rectangles and Basics die and your manual die cutting machine, cut your background mat from the decorative paper. Using a piece of hydra sponge and ColorBox Pigment Ink - Frost White, dab ink onto several areas along each side of the decorative paper mat. Sprinkle with white embossing powder and set using heat tool. Using one of the larger heart dies from the Eyelet Hearts Die, cut a heart into the far side of the decorative paper as shown, creating a heart shaped window in which to stamp sentiment. Next, using the same heart die cut, locate the slightly larger eyelet heart die version that coordinates and nest the two together using a low tack tape. Then die cut from white card stock to create an eyelet shaped heart frame. Ink heart frame using Ranger Archival Ink - Magenta Hue. Using a piece of hydra sponge, apply a thin layer of Designer Dries Clear Adhesive to the heart shaped frame and sprinkle with Rajni Chawla's Crystal Clear. Cut a smaller heart die cut from the Eyelet Hearts Die from white card stock. Ink edges using Ranger Archival Ink - Magenta Hue. Stamp Valentine's Day sentiment onto heart using Ranger Archival Ink - Jet Black. Stamp second sentiment into heart shaped window using Ranger Archival Ink - Jet Black. Adhere glittered heart frame to large die cut heart shaped window. Stamp one inking of the large tulip blossoms, and two of the tulip filled bucket found in the Tulip Bouquet Die onto smooth watercolor paper using Ranger Archival Ink - Jet Black. Color using Zig Clean Color Real Brush Markers. Using the coordinating dies, die cut all embellishments. Die cut the smaller tulip blossoms from the bouquet in the tulip bucket using the coordinating die. Using Deluxe Flower Shaping Kit, shape small tulips slightly. From the second bucket image, using scissors cut off the bucket portion of the image as you will just use the tulip bouquet from the illustration. 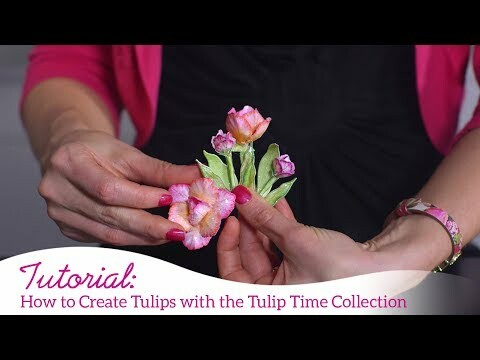 Using a dries clear glue, layer the shaped tulips onto the bouquet you've trimmed off of the bucket image. Stamp two inkings of the small tulip blossom petals from the Tulip Time Cling Stamp Set onto white card stock using Ranger Archival Ink - Plum. Die cut using coordinating die. Using Stack and Store Daubers, ink petals using Ranger Archival Ink - Magenta Hue, and then add Ranger Archival Ink - Vermillion overtop. Shape ever so slightly using Deluxe Flower Shaping Kit. Adhere two petal pieces together to create flower - you will need two. Stamp one inking of petite florals from the Floral Fashionista Cling Stamp Set onto white card stock first using Ranger Archival Ink - Magenta Hue, and then another stamping in Ranger Archival Ink - Majestic Violet. Ink each of the petals in the corresponding colors they have been stamped in. Die cut using coordinating dies, and then shape using 3D Petite Florals Shaping Mold. Stamp several leaves from the Small and Large Sweet Peony Cling Stamp Sets onto white card stock using Ranger Archival Ink - Fern Green. Color using Stack and Store Daubers using Ranger Achival Ink - Leaf Green. Die cut using coordinating dies, and shape slightly using Deluxe Flower Shaping Kit. Position and adhere the larger tulip flowers beside the large heart die cut window as a background accent for behind smaller heart die cut. Next, position and adhere a portion of the smaller tulip bouquet to the backside of the smaller heart die cut so the bouquet flows from the bottom of the heart shape. Using pop dots, adhere small heart to card base as shown. Add tulip flowers and petite florals as shown. Add in peony leaves as fillers where desired. Using Designer Dries Clear Adhesive and metal tip, apply prills to flower centers and Crystal Ultrafine Transparent Glitter to all flowers and die cut embellishments.